Growth hormone (GH) is a peptide hormone necessary for normal postnatal growth as well as human metabolism. It works via its widely expressed receptor (GHR), which is a dimer of transmembrane glycoproteins, belonging to cytokines type I receptor family. Signaling via GHR is initiated by conformational changes triggered upon GH association. GHR is recognized as an important therapeutic target for treatment of many pathologic conditions, including growth disorders and cancer by designing highly specific and efficient GHR agonists or antagonists. However, engineering of such molecules requires deep understanding of the structure and function of both GH and GHR protein molecules. This work reviews the current status of knowledge covering the molecular structure of both GH and GHR and their molecular interactions, in addition to different GH agonists or antagonists developed to regulate GH action. Human growth hormone (GH) is a 191-amino acid peptide hormone secreted from somatotrophs of the anterior pituitary under stimulation of GH-releasing hormone (GHRH). GH considered to be the central endocrine postnatal growth regulator and the only hormone to date with known dose-dependent stimulation of longitudinal growth. GH also regulates carbohydrate, protein, and lipid metabolism. It exerts its metabolic activity via the widely expressed growth hormone receptor (GHR), but predominantly in liver. GH binding to the GHR stimulates the release of the insulin-like growth factor-1 (IGF-1) that mediates most of the GH metabolic activities; however, a direct action of the GH has been also confirmed experimentally. Defects in GH gene causes GH deficiency (GHD) characterized by severe growth retardation and dwarfism while defects in GHR gene causes GH insensitivity syndrome (GHIS) or Laron syndrome with similar manifestations to GHD, reviewed in. Inappropriate overproduction of GH from the anterior pituitary, usually due to pituitary adenomas, resulted in overgrowth conditions with high mortality rate known as gigantism and acromegaly. Apart from anterior pituitary endocrine GH secretion, autocrine/paracrine mode secretion has been reported in several human tissues, including mammary, central nervous system, immune and lung cells with a predicted proliferative function. Autocrine GH has been linked to several human malignancies, especially mammary carcinoma. Therefore, GHR has been suggested as an important target for the treatment of several GH-derived disease conditions by designing efficient GHR agonists or antagonists. However, designing of such molecules requires extensive knowledge about the structure and function of the GH and GHR molecules. This work will revisit the GH and GHR gene and protein structure and revise the molecular mechanism of GH-GHR interaction as well as current models for GHR activation. In addition, this review also discusses the available GH agonists or antagonists and their application in treatment of either GH deficiency or GH excess disease conditions. Recent studies have shown that the GHR, as well as other type I cytokine receptors, such as erythropoietin receptor, exists as a preformed dimer on the cell membrane in the absence of the GH. , Therefore, the activation of the GHR must be mediated by conformational changes rather than receptor dimerization on the GH binding [Figure 4]b. Brown and his colleagues have investigated a new model for GHR activation that involves a rotation in the transmembrane domains and juxtamembrane region of the individual GHR molecule upon GH binding. The study is based on a comparison of the already published crystal structures of unliganded GHR against the GH:GHR 1:1 and 1:2 complex crystal structures and they predict that a rotation might occur as a result of asymmetric binding of the GHR dimer to the binding sites present on the GH. Consistent with the subunit rotation model, using atomistic molecular dynamics simulation recently it has been found that removal of the GH from the GH:GHR2 complex resulted in a 30°-64° anticlockwise rotation in the 2 receptor subunits relative to each other. In another study, Pang et al. suggested 2 essential rotations in the GHR molecules upon GH binding for receptor activation; one is a scissor-like rotation that separates intracellular domains from each other to make a room for the Janus kinase molecules and a second self-rotation allow proper orientation of these molecules for transphosphorylation. Other conformational changes may also play an important role in GHR activation. Treatment of cancer by GH/IGF-I axis blockade has been suggested and tested. Somatostatin analogues (SSA) in conjunction with anticancer chemotherapy has been shown to benefit some patients with breast and prostate cancers in terms of progression reduction and symptoms improvement. However, there was insufficient evidence suggesting routine endorsement of these agents in clinical trials. Pegvisomant, although there are no encouraging human studies, has been shown to reduce tumor growth by up to 40% in tumor xenografted mice  and recently, it has been shown that GHR antagonist pegvisomant inhibits GH-induced chemoresistance by enhancing apoptosis in breast cancer cell lines. Therefore, pegvisomant represents a potential treatment option that should be considered in combat against GH-expressing tumors. GH is a multifunctional peptide hormone needed for normal growth, hepatic metabolism, and immune function. 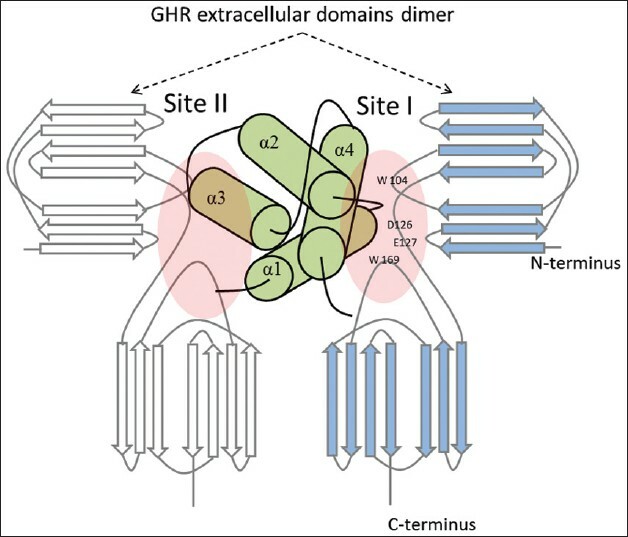 In the past 20 years, structural studies of GH in complex with GHR extracellular domains has revealed that GH is a bundle of 4 α-helices stabilized by 2 disulfide and several hydrogen bonds while GHR extracellular domain is formed of 2 FNIII subdomains each with 7 antiparallel β-strands. During cellular signaling, the GH binds 2 GHR molecules between FNIII subdomains and causes the conformational changes to turn on the receptor. Two models of GHR activation have been proposed to date: GH-induced dimerization model and GH-induced conformational change model. The former model suggests that the GH binds to 2 GHR monomers sequentially causing receptor dimerization and initiation of signaling. In the second model, the GH binds to a preformed GHR dimer causing conformational changes necessary for signaling, including rotations in the GHR subdomains. These conformational changes bring the Jak2 molecules present on the cytoplasmic domain of the GHR into close proximity when they activate each other. 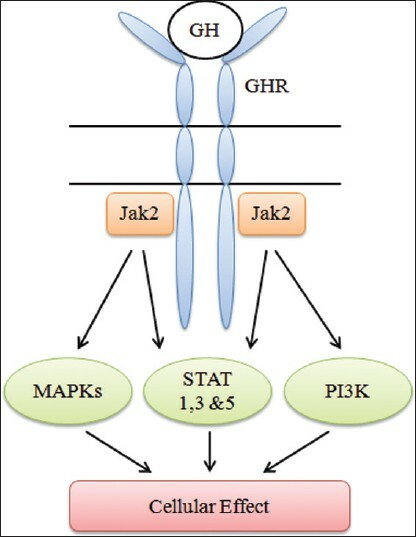 Activation of Jak2 leads to activation of several signaling molecules and transcription factors possessing an Src homology2 (SH2) domain, especially STAT5a and b. In conclusion, GH and its receptor are important molecules involved in many pathophysiologic conditions, most importantly, growth disorders and cancer. 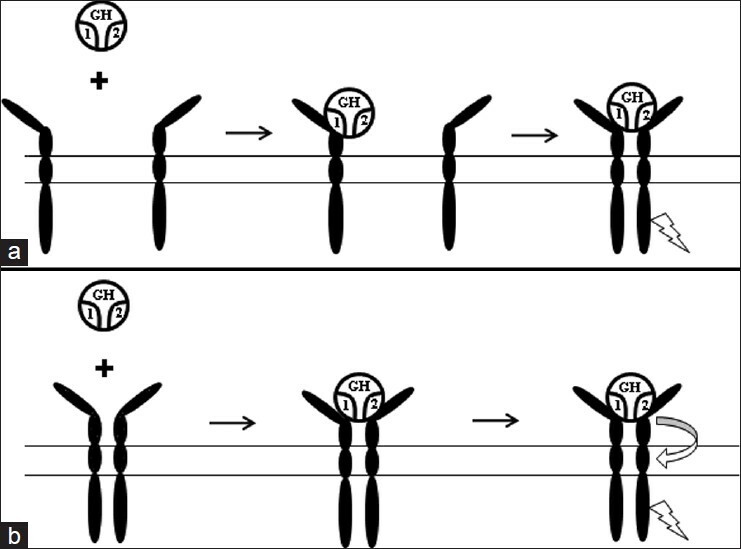 They interact with each other, as many cytokines, in a unique GH:GHR2 manner where the ligand causes a conformational change and signaling. Exogenous manipulation GHR activity by activating (agonists) or deactivating (antagonists) molecules possess a great therapeutic potential. For instant, pegylated GH and GH-GHBP fusion molecules are promising tools for prolonged GH activity in treatment of GHD. On the other hand, the GHR antagonist pegvisomant (GH with mutated site-2) has been introduced successfully in treatment of acromegaly and potentially other proliferative conditions, such as breast cancer. 1. Strobl JS, Thomas MJ. Human growth hormone. Pharmacol Rev 1994;46:1-34. 2. Moller N, Jorgensen JO. Effects of growth hormone on glucose, lipid, and protein metabolism in human subjects. Endocr Rev 2009;30:152- 77. 3. Florini JR, Ewton DZ, Coolican SA. Growth hormone and the insulin-like growth factor system in myogenesis. Endocr Rev 1996;17:481-517. 4. Laron Z. Prismatic cases: Laron syndrome (primary growth hormone resistance) from patient to laboratory to patient. J Clin Endocrinol Metab 1995;80:1526-31. 5. Harvey S. Extrapituitary growth hormone. Endocrine 2010;38:335-59. 6. Mukhina S, Mertani HC, Guo K, Lee KO, Gluckman PD, Lobie PE. Phenotypic conversion of human mammary carcinoma cells by autocrine human growth hormone. Proc Natl Acad Sci U S A 2004;101:15166-71. 7. Chen EY, Liao YC, Smith DH, Barrera-Saldaña HA, Gelinas RE, Seeburg PH. The human growth hormone locus: Nucleotide sequence, biology, and evolution. Genomics 1989;4:479-97. 8. Bodner M, Castrillo JL, Theill LE, Deerinck T, Ellisman M, Karin M. The pituitary-specific transcription factor GHF-1 is a homeobox-containing protein. Cell 1988;55:505-18. 9. DeNoto FM, Moore DD, Goodman HM. Human growth hormone DNA sequence and mRNA structure: Possible alternative splicing. Nucleic Acids Res 1981;9:3719-30. 10. Lecomte CM, Renard A, Martial JA. A new natural hGH variant--17.5 kd--produced by alternative splicing. An additional consensus sequence which might play a role in branchpoint selection. Nucleic Acids Res 1987;15:6331-48. 11. Baumann GP. Growth hormone isoforms. Growth Horm IGF Res 2009;19:333-40. 12. de Vos AM, Ultsch M, Kossiakoff AA. Human growth hormone and extracellular domain of its receptor: Crystal structure of the complex. Science 1992;255:306-12. 13. Leung DW, Spencer SA, Cachianes G, Hammonds RG, Collins C, Henzel WJ, et al. Growth hormone receptor and serum binding protein: Purification, cloning and expression. Nature 1987;330:537-43. 14. Godowski PJ, Leung DW, Meacham LR, Galgani JP, Hellmiss R, Keret R, et al. Characterization of the human growth hormone receptor gene and demonstration of a partial gene deletion in two patients with Laron-type dwarfism. Proc Natl Acad Sci U S A 1989;86:8083-7. 15. Bazan JF. Structural design and molecular evolution of a cytokine receptor superfamily. Proc Natl Acad Sci U S A 1990;87:6934-8. 16. Fuh G, Mulkerrin MG, Bass S, McFarland N, Brochier M, Bourell JH, e al. The human growth hormone receptor. 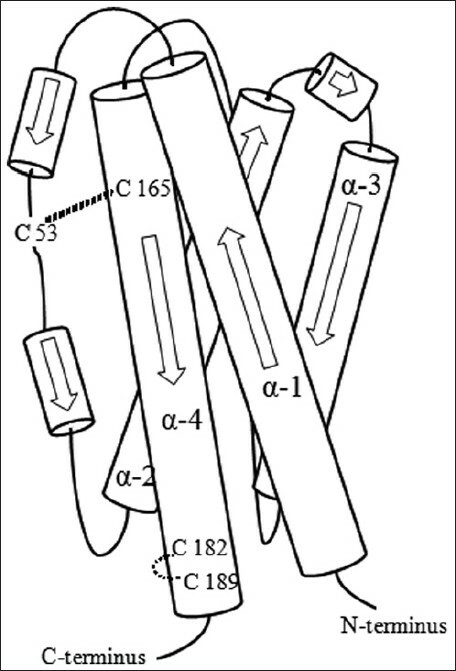 Secretion from Escherichia coli and disulfide bonding pattern of the extracellular binding domain. J Biol Chem 1990;265:3111-5. 17. Harding PA, Wang XZ, Kelder B, Souza S, Okada S, Kopchick JJ. In vitro mutagenesis of growth hormone receptor Asn-linked glycosylation sites. Mol Cell Endocrinol 1994;106:171-80. 18. Postel-Vinay MC, Kelly PA. Growth hormone receptor signalling. Baillieres Clin Endocrinol Metab 1996;10:323-36. 19. Argetsinger LS, Carter-Su C. Mechanism of signaling by growth hormone receptor. Physiol Rev 1996;76:1089-107. 20. Govers R, ten Broeke T, van Kerkhof P, Schwartz AL, Strous GJ. Identification of a novel ubiquitin conjugation motif, required for ligand-induced internalization of the growth hormone receptor. EMBO J 1999;18:28-36. 21. Katsumata N. Growth hormone-binding protein (GHBP). Nihon Rinsho 2010;68 Suppl 7:200-2. 22. Baumann G, Stolar MW, Amburn K, Barsano CP, DeVries BC. A specific growth hormone-binding protein in human plasma: Initial characterization. J Clin Endocrinol Metab 1986;62:134-41. 23. Herington AC, Ymer S, Stevenson J. Identification and characterization of specific binding proteins for growth hormone in normal human sera. J Clin Invest 1986;77:1817-23. 24. Baumann G, Amburn K, Shaw MA. The circulating growth hormone (GH)-binding protein complex: A major constituent of plasma GH in man. Endocrinology 1988;122:976-84. 25. Amit T, Youdim MB, Hochberg Z. Clinical review 112: Does serum growth hormone (GH) binding protein reflect human GH receptor function? J Clin Endocrinol Metab 2000;85:927-32. 26. Baumbach WR, Horner DL, Logan JS. The growth hormone-binding protein in rat serum is an alternatively spliced form of the rat growth hormone receptor. Genes Dev 1989;3:1199-205. 27. Smith WC, Kuniyoshi J, Talamantes F. Mouse serum growth hormone (GH) binding protein has GH receptor extracellular and substituted transmembrane domains. Mol Endocrinol 1989;3:984-90. 28. Ross RJ, Esposito N, Shen XY, Von Laue S, Chew SL, Dobson PR, et al. A short isoform of the human growth hormone receptor functions as a dominant negative inhibitor of the full-length receptor and generates large amounts of binding protein. Mol Endocrinol 1997;11:265-73. 29. Trivedi B, Daughaday WH. Release of growth hormone binding protein from IM-9 lymphocytes by endopeptidase is dependent on sulfhydryl group inactivation. Endocrinology 1988;123:2201-6. 30. Wang X, He K, Gerhart M, Huang Y, Jiang J, Paxton RJ, et al. Metalloprotease-mediated GH receptor proteolysis and GHBP shedding. Determination of extracellular domain stem region cleavage site. J Biol Chem 2002;277:50510-9. 31. Lobie PE, Wood TJ, Chen CM, Waters MJ, Norstedt G. Nuclear translocation and anchorage of the growth hormone receptor. J Biol Chem 1994;269:31735-46. 32. Graichen R, Sandstedt J, Goh EL, Isaksson OG, Törnell J, Lobie PE. The growth hormone-binding protein is a location-dependent cytokine receptor transcriptional enhancer. J Biol Chem 2003;278:6346-54. 33. Urbanek M, MacLeod JN, Cooke NE, Liebhaber SA. 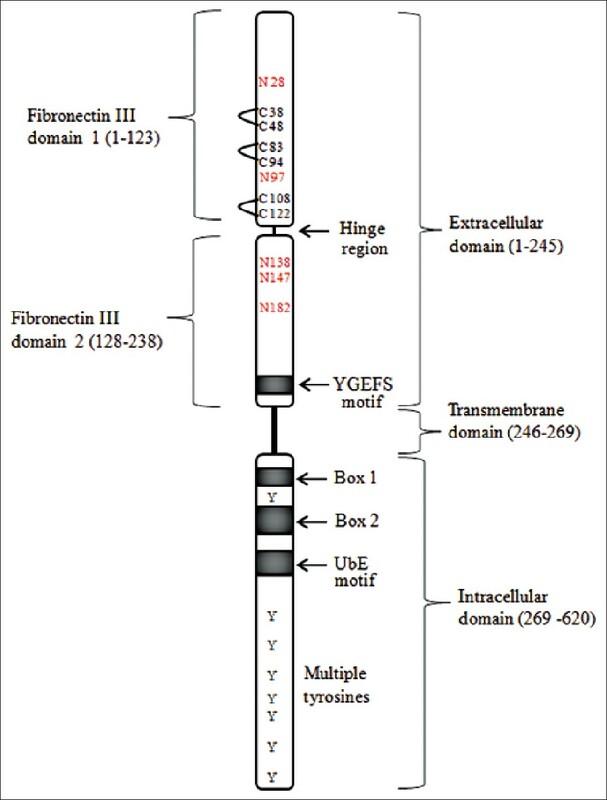 Expression of a human growth hormone (hGH) receptor isoform is predicted by tissue-specific alternative splicing of exon 3 of the hGH receptor gene transcript. Mol Endocrinol 1992;6:279-87. 34. Esposito N, Paterlini P, Kelly PA, Postel-Vinay MC, Finidori J. Expression of two isoforms of the human growth hormone receptor in normal liver and hepatocarcinoma. Mol Cell Endocrinol 1994;103:13-20. 35. Strawbridge RJ, Kärvestedt L, Li C, Efendic S, Ostenson CG, Gu HF, et al. GHR exon 3 polymorphism: Association with type 2 diabetes mellitus and metabolic disorder. Growth Horm IGF Res 2007;17:392-8. 36. Sorensen K, Aksglaede L, Munch-Andersen T, Aachmann-Andersen NJ, Leffers H, Helge JW, et al. Impact of the growth hormone receptor exon 3 deletion gene polymorphism on glucose metabolism, lipids, and insulin-like growth factor-I levels during puberty. J Clin Endocrinol Metab 2009;94:2966-9. 37. Shen Y, Wang L, Zhao Y, You L, Geng L, Gu HF, et al. Evaluation of the association between GHR exon 3 polymorphism and polycystic ovary syndrome among Han Chinese women. Growth Horm IGF Res 2011;21:248-51. 38. Dastot F, Sobrier ML, Duquesnoy P, Duriez B, Goossens M, Amselem S. Alternatively spliced forms in the cytoplasmic domain of the human growth hormone (GH) receptor regulate its ability to generate a soluble GH-binding protein. Proc Natl Acad Sci U S A 1996;93:10723-8. 39. Amit T, Bergman T, Dastot F, Youdim MB, Amselem S, Hochberg Z. A membrane-fixed, truncated isoform of the human growth hormone receptor. J Clin Endocrinol Metab 1997;82:3813-7. 40. Minamitani K. [Truncated growth hormone receptor mutations function as dominant-negative inhibitors of the full-length receptor and cause genetic short stature]. Nihon Rinsho 2002;60:313-8. 41. Cunningham BC, Wells JA. Comparison of a structural and a functional epitope. J Mol Biol 1993;234:554-63. 42. Bass SH, Mulkerrin MG, Wells JA. A systematic mutational analysis of hormone-binding determinants in the human growth hormone receptor. Proc Natl Acad Sci U S A 1991;88:4498-502. 43. Clackson T, Wells JA. A hot spot of binding energy in a hormone-receptor interface. Science 1995;267:383-6. 44. Cunningham BC, Ultsch M, De Vos AM, Mulkerrin MG, Clauser KR, Wells JA. Dimerization of the extracellular domain of the human growth hormone receptor by a single hormone molecule. Science 1991;254:821-5. 45. Fuh G, Cunningham BC, Fukunaga R, Nagata S, Goeddel DV, Wells JA. Rational design of potent antagonists to the human growth hormone receptor. Science 1992;256:1677-80. 46. Brown RJ, Adams JJ, Pelekanos RA, Wan Y, McKinstry WJ, Palethorpe K, et al. Model for growth hormone receptor activation based on subunit rotation within a receptor dimer. Nat Struct Mol Biol 2005;12:814-21. 47. Waters MJ, Brooks AJ. Growth hormone receptor: Structure function relationships. Horm Res Paediatr 2011;76 Suppl 1:12-6. 48. Poger D, Mark AE. Turning the growth hormone receptor on: Evidence that hormone binding induces subunit rotation. Proteins 2010;78:1163- 74. 49. Pang X, Zhou HX. A common model for cytokine receptor activation: Combined scissor-like rotation and self-rotation of receptor dimer induced by class I cytokine. PLoS Comput Biol 2012;8:e1002427. 50. Liu KD, Gaffen SL, Goldsmith MA. JAK/STAT signaling by cytokine receptors. Curr Opin Immunol 1998;10:271-8. 51. Zhu T, Goh EL, Graichen R, Ling L, Lobie PE. Signal transduction via the growth hormone receptor. Cell Signal 2001;13:599-616. 52. Choi HK, Waxman DJ. Pulsatility of growth hormone (GH) signalling in liver cells: Role of the JAK-STAT5b pathway in GH action. Growth Horm IGF Res 2000;10 Suppl B:S1-8. 53. Tang JZ, Zuo ZH, Kong XJ, Steiner M, Yin Z, Perry JK, et al. Signal transducer and activator of transcription (STAT)-5A and STAT5B differentially regulate human mammary carcinoma cell behavior. Endocrinology 2010;151:43-55. 54. Birzniece V, Sata A, Ho KK. Growth hormone receptor modulators. Rev Endocr Metab Disord 2009;10:145-56. 55. Herrington J, Smit LS, Schwartz J, Carter-Su C. The role of STAT proteins in growth hormone signaling. Oncogene 2000;19:2585-97. 56. Lanning NJ, Carter-Su C. Recent advances in growth hormone signaling. Rev Endocr Metab Disord 2006;7:225-35. 57. Winston LA, Bertics PJ. Growth hormone stimulates the tyrosine phosphorylation of 42- and 45-kDa ERK-related proteins. J Biol Chem 1992;267:4747-51. 58. Zhu T, Goh EL, LeRoith D, Lobie PE. Growth hormone stimulates the formation of a multiprotein signaling complex involving p130(Cas) and CrkII. Resultant activation of c-Jun N-terminal kinase/stress-activated protein kinase (JNK/SAPK). J Biol Chem 1998;273:33864-75. 59. Zhu T, Lobie PE. Janus kinase 2-dependent activation of p38 mitogen-activated protein kinase by growth hormone. Resultant transcriptional activation of ATF-2 and CHOP, cytoskeletal re-organization and mitogenesis. J Biol Chem 2000;275:2103-14. 60. Ridderstrale M, Tornqvist H. PI-3-kinase inhibitor Wortmannin blocks the insulin-like effects of growth hormone in isolated rat adipocytes. Biochem Biophys Res Commun 1994;203:306-10. 61. Kilgour E, Gout I, Anderson NG. Requirement for phosphoinositide 3-OH kinase in growth hormone signalling to the mitogen-activated protein kinase and p70s6k pathways. Biochem J 1996;315 (Pt 2): 517-22. 62. Tripathi A, Sodhi A. Growth hormone-induced production of cytokines in murine peritoneal macrophages in vitro: role of JAK/STAT, PI3K, PKC and MAP kinases. Immunobiology 2009;214:430-40. 63. Wan Y, McDevitt A, Shen B, Smythe ML, Waters MJ. Increased site 1 affinity improves biopotency of porcine growth hormone. Evidence against diffusion dependent receptor dimerization. J Biol Chem 2004;279:44775-84. 64. Clark R, Olson K, Fuh G, Marian M, Mortensen D, Teshima G, et al. Long-acting growth hormones produced by conjugation with polyethylene glycol. J Biol Chem 1996;271:21969-77. 65. Rasmussen MH, Jensen L, Anderson TW, Klitgaard T, Madsen J. Multiple doses of pegylated long-acting growth hormone are well tolerated in healthy male volunteers and possess a potential once-weekly treatment profile. Clin Endocrinol (Oxf) 2010;73:769-76. 66. Kemp SF, Fielder PJ, Attie KM, Blethen SL, Reiter EO, Ford KM, et al. Pharmacokinetic and pharmacodynamic characteristics of a long-acting growth hormone (GH) preparation (nutropin depot) in GH-deficient children. J Clin Endocrinol Metab 2004;89:3234-40. 67. Jostel A, Mukherjee A, Alenfall J, Smethurst L, Shalet SM. A new sustained-release preparation of human growth hormone and its pharmacokinetic, pharmacodynamic and safety profile. Clin Endocrinol (Oxf) 2005;62:623-7. 68. Wilkinson IR, Ferrandis E, Artymiuk PJ, Teillot M, Soulard C, Touvay C, et al. A ligand-receptor fusion of growth hormone forms a dimer and is a potent long-acting agonist. Nat Med 2007;13:1108-13. 69. Chen WY, Wight DC, Wagner TE, Kopchick JJ. Expression of a mutated bovine growth hormone gene suppresses growth of transgenic mice. Proc Natl Acad Sci U S A 1990;87:5061-5. 70. Cunningham BC, Wells JA. High-resolution epitope mapping of hGH-receptor interactions by alanine-scanning mutagenesis. Science 1989;244:1081-5. 71. Ross RJ, Leung KC, Maamra M, Bennett W, Doyle N, Waters MJ, et al. Binding and functional studies with the growth hormone receptor antagonist, B2036-PEG (pegvisomant), reveal effects of pegylation and evidence that it binds to a receptor dimer. J Clin Endocrinol Metab 2001;86:1716-23. 72. van Neck JW, Dits NF, Cingel V, Hoppenbrouwers IA, Drop SL, Flyvbjerg A. Dose-response effects of a new growth hormone receptor antagonist (B2036-PEG) on circulating, hepatic and renal expression of the growth hormone/insulin-like growth factor system in adult mice. J Endocrinol 2000;167:295-303. 73. Feelders RA, Hofland LJ, van Aken MO, Neggers SJ, Lamberts SW, de Herder WW, et al. Medical therapy of acromegaly: Efficacy and safety of somatostatin analogues. Drugs 2009;69:2207-26. 74. Neggers SJ, van der Lely AJ. Pegvisomant and improvement of quality of life in acromegalic patients. Horm Res Paediatr 2011;76 Suppl 1:102-5. 75. Dutta P, Bhansali A, Vaiphei K, Dutta U, Ravi Kumar P, Masoodi S, et al. Colonic neoplasia in acromegaly: Increased proliferation or deceased apoptosis? Pituitary 2012;15:166-73. 76. Yang X, Liu F, Xu Z, Chen C, Li G, Wu X, et al. Growth hormone receptor expression in human colorectal cancer. Dig Dis Sci 2004;49:1493-8. 77. Weiss-Messer E, Merom O, Adi A, Karry R, Bidosee M, Ber R, et al. Growth hormone (GH) receptors in prostate cancer: Gene expression in human tissues and cell lines and characterization, GH signaling and androgen receptor regulation in LNCaP cells. Mol Cell Endocrinol 2004;220:109-23. 78. Wagner K, Hemminki K, Israelsson E, Grzybowska E, Klaes R, Chen B, et al. Association of polymorphisms and haplotypes in the human growth hormone 1 (GH1) gene with breast cancer. Endocr Relat Cancer 2005;12:917-28. 79. Wagner K, Hemminki K, Grzybowska E, Bermejo JL, Butkiewicz D, Pamula J, et al. Polymorphisms in the growth hormone receptor: A case-control study in breast cancer. Int J Cancer 2006;118:2903-6. 80. Brunet-Dunand SE, Vouyovitch C, Araneda S, Pandey V, Vidal LJ, Print C, et al. Autocrine human growth hormone promotes tumor angiogenesis in mammary carcinoma. Endocrinology 2009;150:1341-52. 81. Mojarrad M, Momeny M, Mansuri F, Abdolazimi Y, Tabrizi MH, Ghaffari SH, et al. Autocrine human growth hormone expression leads to resistance of MCF-7 cells to tamoxifen. Med Oncol 2010;27:474-80. 82. Zatelli MC, Minoia M, Molè D, Cason V, Tagliati F, Margutti A, et al. Growth hormone excess promotes breast cancer chemoresistance. J Clin Endocrinol Metab 2009;94:3931-8. 83. Hejna M, Schmidinger M, Raderer M. The clinical role of somatostatin analogues as antineoplastic agents: Much ado about nothing? Ann Oncol 2002;13:653-68. 84. Thankamony GN, Dunger DB, Acerini CL. Pegvisomant: Current and potential novel therapeutic applications. Expert Opin Biol Ther 2009;9:1553-63. 85. Minoia M, Gentilin E, Molè D, Rossi M, Filieri C, Tagliati F, et al. Growth hormone receptor blockade inhibits growth hormone-induced chemoresistance by restoring cytotoxic-induced apoptosis in breast cancer cells independently of estrogen receptor expression. J Clin Endocrinol Metab 2012;97:E907-16. 1 MECHANISMS IN ENDOCRINOLOGY: Lessons from growth hormone receptor gene-disrupted mice: are there benefits of endocrine defects?